Are You Having Reception Problems in Black River? 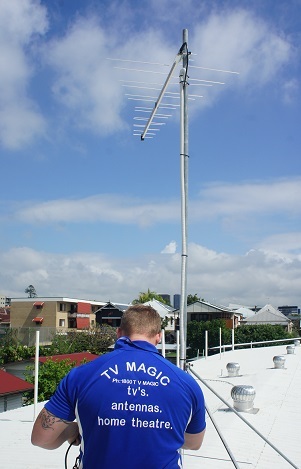 Call TV Magic Today! If you're a hard working Black River resident then there's a good chance that, at the end of the day, there's nothing more that you want to do than come hoem and enjoy a bit of entertainment on the TV, but what if you come home, exicted to see your favourite show, and you find that the channels are dropping in and out so badly that you can hardly see anything? This can be very frustrating, especially if you don't have time to be dealing with a faulty TV signa;. Surely there's an easy way to get it fixed and back on again without going through the hassle of sorting through companies or trying to figure out the problem yoursefl? Well there is! I'm your locla TV Magic technician Gordon and I can come out and get an assessment of your Reception situation done in no-time. It's easy, all you have to do is give me a call and we'll organise a time that's convenient for you when I can come out and make your Reception Problems dissapear. One thing that makes it hard to get to the bottom of your own Reception problems is that they can come from a range of different sources which may be related to your antenna, your positioning and access to signal or it could even be something like your cabling that's been chewed by rats. Considering that there can be so many different things responsible for your Reception problems, it's always better to get a professional to help you get to the bottom of it quickly and effectively rather than stressing yourself out and wasting time trying to fix it yourself to no avail. So why not give me a call today and let me make your reception problems dissapear!